According to recent report by WGBH Boston, The North Atlantic cod fishery was once world famous for the unbelievable numbers of fish found there. When John Cabot first discovered George’s Bank, he said that one could have walked on the fish, they were so thick. In the 1950’s, new technology such as flash freezers, sonar, radar, and increased engine power and range allowed fisherman to decimate the cod population. Fisherman were so efficient, that by 1992, the fishery had collapsed and Canada closed the fishery with no opening in site. Today, the effects of this closure are still felt in small towns in Canada, such as Petley, as fishing village in Newfoundland, according to WGBH. Without cod to provide jobs, the local economy collapsed as well. People left in alarming rates. Today, Petley has almost no young children. Canadian politicians are looking for a resurgence in cod numbers to provide jobs once more, and while signs are looking up, scientists are still skeptical. George Rose, and expert on Atlantic cod and author says that while cod numbers are definitely rebounded, the number is still only a fraction of what the fishery used to be. He cautions that more time is needed for cod to attain historic numbers, and that research in the Atlantic is complicated and difficult. 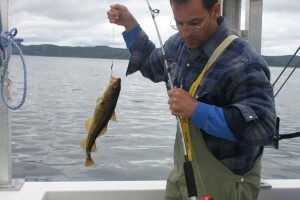 Just because there is an uptick in numbers does not mean that the fishery should be reopened. Humboldt County faces a similar dilemma. Salmon stocks here used to support many families, but numbers of salmon have steadily declined across California, and many experts believe salmonids will become extinct within 50 years in our state. With the example of the Atlantic cod collapse and its effects on local economies, hopefully Humboldt County will be able to help salmonids recover before it is too late.